Arab-Israeli peace projects are projects to promote peace and understanding among Arabs andIsraelis in different spheres. Organizations or institutions which address and analyze policy issues in a wide range of areas. Also includes major projects or efforts which are officially carried out by regional institutions, governments, orNGOs. The Valley of Peace initiative is an official joint effort of the Israeli, Palestinian and Jordanian governments to promote economic cooperation, and new business initiatives which can help both sides work together, and create a better diplomatic atmosphere and better economic conditions. It constitutes a co-existence project, as it is mainly designed to foster efforts in the private sector, once governments provide the initial investment and facilities. Joint economic cooperation between Israeli officials in Gilboa and Palestinian officials in Jenin has begun to have major results and benefits. In October 2009, a new project got underway promoting tourism and travel between the two areas. Major new business efforts and tourist attractions have been initiated in Jenin.The two regions are planning a joint industrial zone which would bridge the border. Palestinians would produce locally-made handicrafts and sell them through Gilboa to other regions of the world. Another possible project is a joint language center, where Israelis and Palestinians would teach each other Arabic and Hebrew, as well as aspects of their cultural heritage. In early 2010, President Shimon Peres took an active and personal role in efforts to promote local business initiatives. Peres personally led a tour of top Israeli executives through the West Bank, and told them about many new Palestinian businesses which show much growth potential. One company highlighted by Peres was the New Generation Technology incubator, a joint Jewish-Arab effort founded in 2002 which encourages new ideas and projects in technology and biotechnology. As of 2011, according to Naftali Bennett, there are about 50 factories in the West Bank industrial region where Jews and Palestinians work together. The Israeli-Palestinian Chamber of Commerce was founded in 2009. Its chairman is Eival Gilady, and its CEO is Ofir Gendelman. It has already held its first conference, at which Tony Blair was the keynote speaker. It is dedicated to promoting development of joint economic initiatives and businesses. The Alliance for Middle East Peace (ALLMEP) is a group comprising over 70 leading non-governmental organizations that work to foster reconciliation between Israelis and Palestinians, as well as Arabs and Jews in the Middle East. One of ALLMEP’s proposals is an independent International Fund for Israeli-Palestinian Peace to support and encourage efforts to build peace in the region. Friends of the Earth Middle East is an organization which brings together environmental activists from Israel, Jordan and the Palestinian Territories, to work on common issues. One of FOEME’s major efforts is a regional advocacy project to promote discussion and sharing of water resources. Middle East Justice and Development Initiatives (Mejdi) is a local grassroots Palestinian organization which was founded by Aziz Abu Sarah, a young Palestinian activist who seeks to advocate cooperation and reconciliation efforts. Mejdi seeks to promote dialogue between Israelis and Palestinians. one part of its peacemaking efforts is to promote local economic development, and strengthening of economic cooperation and Palestinian small businesses. Abu Sarah has been consistently involved in a range of workshops and efforts in which he has promoted greater efforts towards reconciliation and dialogue between individual Israelis and Palestinians. Peres Center for Peace was founded by Shimon Peres and carries out various policy analyses to advance efforts for peace. Formed is 2002, the Aix Group is an Israeli-Palestinian-international economic study team that conducts research on the economic dimension of the conflict. Areas of focus include Palestinian refugees, the construction of a territorial link between the Gaza Strip and the West Bank, development of the Jordan Valley, infrastructure cooperation, the economic status of Jerusalem. Organizations which promote specific projects aimed at promoting co-existence and dialogue between the two sides. The Parents Circle-Families Forum (PC-FF) is a grassroots organization of Palestinian and Israeli families who have lost immediate family members due to the conflict. 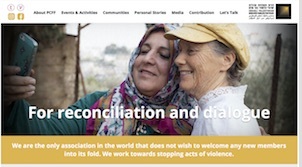 Together, they transform their pain and bereavement into the catalyst for a joint mission of reconciliation and coexistence in the midst of ongoing violence. PC-FF was founded in 1994 by Yitzhak Frankenthal who’s son Arik was killed by the Hamas. Today, PC-FF includes more than 500 members, half Israeli and half Palestinian. The members conduct dialogue sessions, give lectures, and engage in projects to support tolerance and reconciliation. Parents Circle creates innovative projects to spread its message of hope and reconciliation. The Forum firmly believes that without reconciliation, there will only be a cease fire and not peace. PC-FF members from Israel and the Palestinian Territories regularly meet even under nearly impossible circumstances such as right after the Gaza war of 2008-9. The PC-FF’s flagship program for the general public is its educational program. High school “Dialogue Encounters” bring two forum members, one Israeli and one Palestinian to classrooms in Israel, East Jerusalem and the West Bank to talk to students about the possibility of peace and reconciliation. Close to 40,000 students are reached each year. Green Action is an Israeli non-governmental organization which advocates for environmental activism and social change, and has brought fair trade and organic Palestinian olive oil to the Israeli market. Avi Levi, the director, travels frequently to the West Bank to work with Palestinian farmers, helping them set up and maintain cooperatives and obtain organic and fair trade certification. The products are packaged under the SAHA label. SAHA is an acronym for Sachar Hogen, fair trade in Hebrew, and is also the Arabic word, Saha, meaning well-being or good health. In addition to olive oil, the main agricultural product of Palestinians in the West Bank, Green Action also sells za’atar, dibbes, organic fruit jam, herbal infusion and pressed olives. The olive oil is also sold in bulk worldwide including to Australia and the US. In the US, Olive Branch Enterprises of Seattle, Washington buys Green Action in bulk and bottles it under the Peace Oil label. Olives of Peace is a joint Israeli-Palestinian business venture to sell olive oil. Through this project, Israelis and Palestinians have carried out joint training sessions and planning. It has also led to Palestinian oil production being enriched by Israeli components. It has produced olive oil which has been sold under the brand name “Olives of Peace.” This is related to Peace Oil (UK) and Peace Oil (USA). The Israeli Jewish-Israeli Muslim Village of Neve Shalom – Wāħat as-Salām(NSWAS) means “Oasis of Peace” in Hebrew and Arabic. NSWAS provides a remarkable model of longterm coexistence. Formed in 1970 on land donated by the Roman Catholic Church, NSWAS sits between Jerusalem and Tel Aviv. They organize humanitarian projects, including providing medical assistance for Palestinians. They are also butts to chairs in schools, two for village and other area children, and they have a training facility called the School for Peace. The children’s classes run from pre-school through Middle School and are all taught by both Muslims & Jews in their native languages. The School for Peace however is designed for adult Arabs and Jews from all over the area to learn about each other in controlled seminars run by trained Peace Facilitators. An American branch recently incorporated under the name “American Friends of Neve Shalom” they are a non-profit 501(c)3 organization that raises funds in the US for NSWAS programs (similar support groups also exist in the EU, and elsewhere). Hamidrasha, a center for study and fellowship, works to address alienation, estrangement, and mutual ignorance between Jews and Arabs. Hamidrasha is establishing an inter-cultural Beit Midrash (Hebrew, “House of study”), which will serve as a basis for mutual personal and communal encounters, and for the study of cultural narratives and modern texts of both peoples. Jewish, Muslim and Christian men and women will engage in a true inter-cultural learning experience, with the goal of making a significant contribution to the ongoing dialogue between Jews and Arabs, and strengthening their reciprocal ties. Founded in 1993, Seeds of Peace brings together hundreds of emerging young leaders and educators from conflict regions at the Seeds of Peace International Camp in Otisfield, Maine, USA, including thousands of Israeli, Palestinian,Jordanian, and Egyptian teens. The mission of Seeds of Peace is to provide new generations of leaders in conflict regions with the relationships, understanding, and skills needed to advance lasting peace. There are over 5,000 graduates of the Camp from 27 countries. From 2003-2007, the Jewish-Palestinian Living Room Dialogue Group partnered with Camp Tawonga over five-years to bring hundreds of adults and youth from 50 different towns in Palestine and Israel to successfully live and communicate together at the Palestinian-Jewish Family Peacemakers Camp—Oseh Shalom – Sanea al-Salam. Children of Peace is a UK-based, non-partisan, international conflict-resolution charity that aims to build friendship, trust and reconciliation between Israeli and Palestinian children, aged 4–17 regardless of community, culture, faith, gender or heritage through arts, education, healthcare and sports projects and programmes, so that a future generation and their communities might live in peace, side-by-side. Founded in 2004 by the charity’s President, Richard Martin, Children of Peacereceives personal support from world leaders including Pope Francis, American Vice-President Joe Biden, Quartet Envoy Tony Blair, British Prime Minister David Cameron, British Deputy Prime Minister Nick Clegg, British Labour Leader Ed Miliband, Bill Clinton, French President François Hollande, former Mayor of Hebron Khaled Osaily and Palestinian Envoy to the UK Dr Manuel Houssassian. Three UK parliamentarians from each major political party are Goodwill Ambassadors – Louise Ellman MP, Toby Ellwood MP and Ed Davey MP. In 2012, one of the charity’s Goodwill Ambassadors & Director of its Youth Ambassador Programme, Sally Becker carried the Olympic Flag into the stadium at the Opening Ceremony of London 2012, in Children of Peace‘s name. Currently there are 20 Youth Ambassadors, from Armenia, Israel, Palestine, Qatar, the UKand the USA. The charity’s approach is to build understanding between grassroots communities in the region. The charity works with more than 140 affiliate organisations in a unique Coalition of Peace in Gaza, Egypt, Israel, Jordan, Lebanon, Turkey and theWest Bank (and in every continent). Lionel Rogosin filmed Arab Israeli Dialogue in 1973, an early attempt at unlocking the cultural and political issues between Palestinians and Israelis. It is a filmed debate between the Palestinian poet Rashed Hussein and Amos Kenan, shot in New-York as they were both exiled. The Israeli-Palestinian Science Organization is a nongovernmental nonprofit established in 2004 to support collaborative research between scientists in Israel and Palestine. Founding members of IPSO include Nobel prize winning neuroscientist Torsten Wiesel. Founded in 1998 by Israeli-Argentinian pianist and conductor Daniel Barenboimand Palestinian-American author Edward Said, the West-Eastern Divan(named after an anthology of poems by Johann Wolfgang von Goethe) promotes a cultural dialogue between Israelis and Arabs. A principal activity is an orchestra composed mostly of young Israeli and Arab musicians, who are demonstrating the potential for collaboration between the two cultures on the universal ideas that are communicated by great classical music. They have performed throughout the world. Barenboim has also made this point by going into Palestinian areas and giving piano recitals and master classes. Comedy for Peace is a non-political effort to use humor to build trust, understanding and a vision for peace between Palestinians and Israelis. Comedy for Peace was conceived and is being organized by Ray Hanania, a Palestinian-American stand-up comedian – who is married to a Jewish woman. It is Ray’s hope that the power of comedy combined with the power of two peoples coming together on one stage will help Palestinians and Israelis find the courage to look past the pain and the suffering of the conflict and see each other as human beings, as partners and as people who have no other choice but to struggle together to achieve a lasting peace. A Tolerance Monument sculpted by Czesław Dźwigaj in collaboration with Michal Kubiak is situated on a hill marking the divide between Jewish Armon HaNetzivand Arab Jabel Mukaber, standing opposite the United Nations headquarters inJerusalem in a park near Goldman Promenade. Unveiled in Jerusalem in 2008, it was funded by Polish businessman Aleksander Gudzowaty as a symbol to promote peace in the Israeli-Palestinian conflict. The Project, is generously funded by the European Commission’s, European Instrument for Democracy and Human Rights (EIDHR) for Strengthening the role of civil society in promoting human rights and democratic reform, in supporting the peaceful conciliation of group interests and in consolidating political participation and representation (Transnational and regional actions). It is implemented by Future Worlds Center based in Cyprus with the collaboration of the Association for Progressive Education in Honor of Meir Ya’ari (YAARI) and the Palestinian Dialogue Center. The action aims to enhance the capacity in CSOs to actively promote Human Rights within their community, on a national as well as a trans-national level. It actively engages civil society actors from Israel and Palestine to collaborate on jointly developed community action projects that aim to foster mutual understanding, to promote and advocate for the implementation of Human Rights standards in the region. one of the aims is to bring together stakeholders from countries in the same region with the view of facilitating the peaceful conciliation and management of group interests and promoting solutions on divisive matters or controversial areas. Middle East Education Through Technology (MEET) is an innovative educational initiative aimed at creating a common professional language between Israeli and Palestinian youth. Working together with the Massachusetts Institute of Technology (MIT), MEET enables its participants to acquire advanced technological and leadership tools while empowering them to create positive social change within their own communities. Program founders Yaron Binur, Anat Binur, and Assaf Harlap became aware that many Israelis and Palestinians never get a chance to interact with one another on a personal level, even though they grow up and live a few short miles from one another. Inspired by their experiences of multicultural cooperation in international educational institutions, the founders decided that a fast-paced, intensive program in technology would be an ideal medium to bridge the divide. With this vision, they created MEET in the summer of 2004. MEET seeks excelling Palestinian and Israeli high school students; admission into the program is very competitive. Once admitted, students meet continuously for three years. Their first summer includes instruction in basic Java programming; this extends into the first yearlong segment of the program. The second summer includes more advanced topics in computer science and introduces a business and entrepreneurship curriculum. The program is capped by a long-term project beginning in the second yearlong segment and extending into a final summer term. Alumni activities maintain the student network after graduation. MEET graduates have been accepted into top universities in the region and abroad, including the Massachusetts Institute of Technology. The skills and bonds of friendship forged by MEET students, combined with the students’ natural talents, prepare them for a successful future of leadership, achievement, innovation, and cooperation. The Institute for Circlework organizes workshops in Israel that unite Jewish and Arab women, with a particular focus on women leaders. The intention of these workshops is to awaken global consciousness, that is, the awareness of our commonality as members of the human family and of a single planetary community. Circlework is a method developed by a German-Jewish author and seminar leader, Jalaja Bonheim (www.jalajabonheim.com), which she has been practicing and teaching in the United States for 25 years, and in Israel since 2005. Circlework uses circle gatherings to create a field of open-heartedness and love powerful enough to heal individuals and communities. Circlework is based on the assumption that the root causes of violence and war lie within us, and that our own consciousness is where change must begin. The Institute for Circlework offered its latest series of circles in Israel during the Gaza war. To read an account, visit their web site. TEC-the Center for Technology strives to build trust between Arabs and Jews, religious and secular through joint online courses and initiatives between college students and school children. The center established in 2003 by the heads of ICT in 3 teaching colleges is funded by the Mofet Institute Tel Aviv. visit their web site. Groups of political activists or community activists who work for peace through efforts based on political goals and measures, or community efforts. Includes some groups which are composed of activists from one side of the conflict, and some groups which include activists from both sides. Jews for Israeli-Palestinian Peace (JIPF) is a small group founded in Stockholm, Sweden, in 1982, for Swedish Jews who want to actively work towards a peaceful solution for the Israeli-Palestinian conflict. JIPF’s platform include demands for a full Israeli withdrawal, including the evacuation of the Jewish civilian population, from all territories that came under Israeli military control as a result of the Six-Day War, the establishment of a Palestinian Arab state with East Jerusalem as capital and a “solution” to the issue of the Palestinian refugees. JIPF also advocates and participates in dialogue with Hamas and other designated terrorist organizations. While forcefully speaking out against Islamic anti-Semitism and anti-Israeli rhetoric, the American Jewish Committee (AJC) has worked since 1985 to enhance relations between Jews and Muslims. The AJC encourages and engages in dialogue on many levels with like-minded groups committed to fostering tolerance and cooperation. In 1986 the AJC publicly condemned the murder by bomb attack of Alex Odeh (in Oct. 1985), a leader of the American-Arab Anti-Discrimination Committee in Santa Ana, California. The AJC had a meeting with the Federal Bureau of Investigationdirector William Webster about this incident; they urged action to identify and punish those responsible for anti-Arab bigotry. In 1986 the AJC submitted testimony to the United States House of Representatives, Subcommittee on Criminal Justice, on the topic of violence and discrimination towards Arab-Americans. From 1992 to 1995 the AJC worked to lobby the United States government to intervene on behalf on Muslims in Bosnia. In 1993 the AJC sponsored the first national conference on “Muslims and Jews in North America: Past, Present and Future” with the Institute for Islamic-Judaic Studies at University of Denver in October. In 1994 they sponsored the second such conference. The third conference had to be canceled, when the AJC could not found Muslim partners who were willing to publicly condemn the current wave of terrorist attacks on Israel. In 1999 the AJC helped aid Muslims in Kosovo. In 2001 the AJC initiated a new project designed to advance understanding between Muslims and Jews by publishing two books: Children of Abraham: An Introduction to Judaism for Muslims, by Professor Reuven Firestone, a scholar of Islam at Hebrew Union College in Los Angeles, was written to describe Judaism to Muslims; Children of Abraham: An Introduction to Islam for Jews, by professor Khalid Duran, was written to describe Islam for Jews. Children of Abraham seeks to build an international community of Muslim and Jewish youth that celebrates their religious identities. Through an engaging project involving a photographic exploration of Jewish and Muslim communities around the world, and honest, unflinching online dialogue, participants form a network of advocates and ambassadors for ground-breaking Muslim-Jewish relations in six continents. In July 2007 a new Centre for the Study of Muslim-Jewish Relations was opened in Cambridge, United Kingdom. It is partly financed by a £1 million contribution from Richard Stone, a Jewish philanthropist. In the first instance its students they will study common areas between the two religions. Eventually work will extend into more controversial areas, including the Israel-Palestine question. Reverend Sun Myung Moon has initiated several peace projects attempting to defuse hostilities between Muslims, Jews and Christians. In 2003 28 clergy from the United States toured Gaza in September 2003, despite the American Consulate’s warnings of rocket attacks. They were warmly welcomed by local Muslim clerics. Imam Feisal Abdul Rauf, imam of Masjid al-Farah in New York City and founder of the American Sufi Muslim Association (ASMA) Society. Khalid Abou El Fadl, UCLA law professor, works with Jewish and Christian groups to promote inter-faith cooperation and dialogue. ^ A Mideast Valley of Peace, by Jennifer L. Schenker Businessweek article, May 29, 2008. ^ Jenin now open to Arab-Israeli and foreign tourists, By RON FRIEDMAN, jpost.com, 10/9/09. ^ Mutually assured prosperity, By RON FRIEDMAN, jpost.com, 10/15/09. ^ Your guide today is… Shimon Peres, by Ron Friedman, Jerusalem Post, Jan 13, 2010. ^ Do West Bank Realities Defy Perceptions?, by Gary Rosenblatt, Jewish Week, Tuesday, January 25, 2011. ^ Israeli-Palestinian Chamber of Commerce, Peres Center for Peace. ^ Israeli-Palestinian Chamber of Commerce website. ^ 20009 ALLMEP Summit, group website. ^ Mejdi website; Our Philosophy, accessed 12/25/09. ^ To Fatah and back, By LAUREN GELFOND FELDINGER, jpost.com, Nov 19, 2009. ^ Dwoskin, Elizabeth (August 11, 2011). “Trying to Put a Price on Middle East Peace”. Bloomberg Businessweek. ^ Fair Trade In Israel, By KARIN KLOOSTERMAN, Treehugger.com, 6/7/06. ^ “Israel-Palestinian cooperation a decision that makes sense from the economic point of view”, Konrad-Adenauer-Stiftung (KAS) a political foundations in Germany for Mideast dialogue and cooperation, Oct. 26, 2008. ^ New joint Israeli-Palestinian olive oil brand launched, Ynet news, Published: 03.20.07. ^ , by Michael Rogosin, March 3rd 2013. ^ KERSHNER, Isabel (2008-10-17). “Symbol of Peace Stands at Divide Between Troubled Jerusalem’s East and West”. New York Times. Retrieved 2008-10-18. ^ Eli Ashkenazi, “The Jew comes to learn from the Arab – and it works,”Ha’aretz English Edition (Israel), September 21, 2005. Creating Peace at the Grass Root Level. Ten top Israeli business ventures that inspire peace in the Middle East, israel21c.org, February 28, 2010. First Palestinian-Israeli arbitration center to run in 2012, jpost.com 05/02/2011. Leaders of Israel and Palestine Chambers of Commerce sign memorandum of understanding in Sheikh Jarrah to create an internationally backed mediation process. Palestine International Business Forum. PIBF brings together Palestinian, Israeli and Swedish business interests in order to create sustainable economic development in Palestine. 12th Session of the Palestinian – Israeli Young Business Leaders Forum. The 12th session of the Forum took place on Thursday, November 24, 2011 as a site visit to the newly Palestinian planned city called “RAWABI” near Ramallah, followed by a discussion meeting with two Palestinian businessmen Mr. Bashar Masri, Chairman of Massar International and Mr. Talal Nassereddin, CEO of Birzeit Pharmaceutical Company. In a country where separation — even physical walls — between Arabs and Jews is common, Mr. Ron’s perspective stands out. News headlines included the murder of a Jewish settler family in the West Bank as Ron, 51, sat in his Haifa office, flooded by a strong sea breeze. Mr. Ron discussed his work as the executive director of Beit Hagefen Arab Jewish Center, a nonprofit cultural center in Haifa. Though he has no written job description, Mr. Ron said his overall role is to promote a need for mutual respect between people, specifically Jews and Arabs. Beit Hagefen, according to Mr. Ron, is a “window to a multicultural community” where Jews and Arabs interact together. Despite living in the same city, he said, the two groups do not interact, so the center encourages and facilitates connections through activities in the local area. The center has an art gallery, a library, and an Arab theater. It recently began a women’s walking club, a program bringing Arab and Jewish families together in each others’ homes, and a photography class that allows for young people to connect through their work. Founded in 1963, it is a non-profit organization supported by the Haifa municipality; the Ministry of Education, Culture and Sport; and private donations. Read the full article at the OnBeing.com website. URGENT… Friends, Regardless of your position on the current conflict in Palestine and Israel, we need to do what we can to help the innocent people who’ve been impacted by the war. In recent days, over 100,000 Palestinians have been asked to vacate their homes in Gaza in preparation for a comprehensive air, land, and sea bombardment. Yet, they aren’t able to cross the border into Egypt or Israel and they can’t escape by sea — so they have nowhere to go. Homes, hospitals, schools, water treatment facilities, and news media offices have already been bombed — so Gaza is becoming unlivable. In one area, water has been cut off from a refugee camp that has a population of 70,000 people (35% of these people are women or children under the age of six months). Please do what you can to help promote peace in the area as soon as possible. I’m not going to flood my Facebook page with appeals and news. Having Palestinian and Israeli friends, I’m also sensitive about offending either side by simply expressing concern for both sides. For those interested in following the news, including forceful appeals from both sides, as well as those calling for unity and peace between both sides, you can visit the following Facebook page. It’s a resource for those in the middle, working to promote peace, and attempting to understand the divergent narratives.